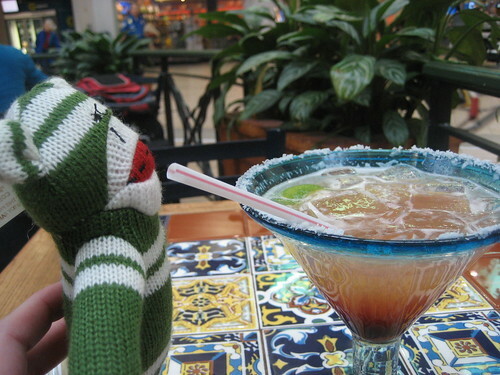 The sock monkey and I had to have a margarita (we chose pomegranate) to dull the pain from finding out that this Chilis location does not have fried cheese sticks. On this date in 2009: Slacking, in which I barely managed to write an entry. 2008: Still Sweet, in which Mr. Karen and I made fancy cookies. 2007: Super, in which my fantasy football team was doing quite well, and Out with the Old, in which I did some organizing. 2006: Quilt Labels, which is a tutorial. 2005: We Have a Winner, in which I shared a very special Christmas tree. 2004: Mantel Arrangements and Other Stuff, in which I passed along circa 1917 decorating advice. 2002: Is It Time to Go Home Yet?, in which I was at the office but did not want to be.